So around five months ago I started on my new blog, The Indie Elitist. 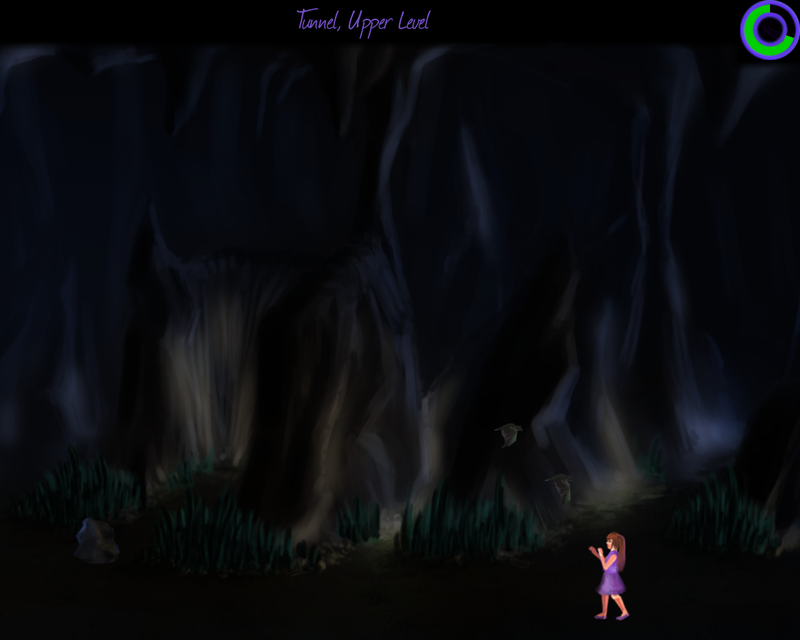 A few things have changed in the blog since then but overall I have stayed consistent to me original idea to provide reviews (of varying sizes) on indie games in a elegant, loving, and very structured manner. Personally, I think that this is the perfect venue specifically for indie games and at some point I might go more in-depth about that but for now I just want to point out what I have been up to over there for the last five months. I have written a total of 98 articles, of which 15 got the prestigious Must Play rating and 31 got the still impressive Should Play rating. I absolutely loved every single one of these games, and would highly recommend all of them. In addition to these gems I also created a number of pages; Most notably The Art of Indie page, which features all of the games that I feel are particularly beautiful; And the Ongoing Sales page, which showcases all of the best ongoing indie game sales. Just posted a article on What Makes you Tick: A Stitch in Time over at The Indie Elitist. The following is a excerpt from the article. 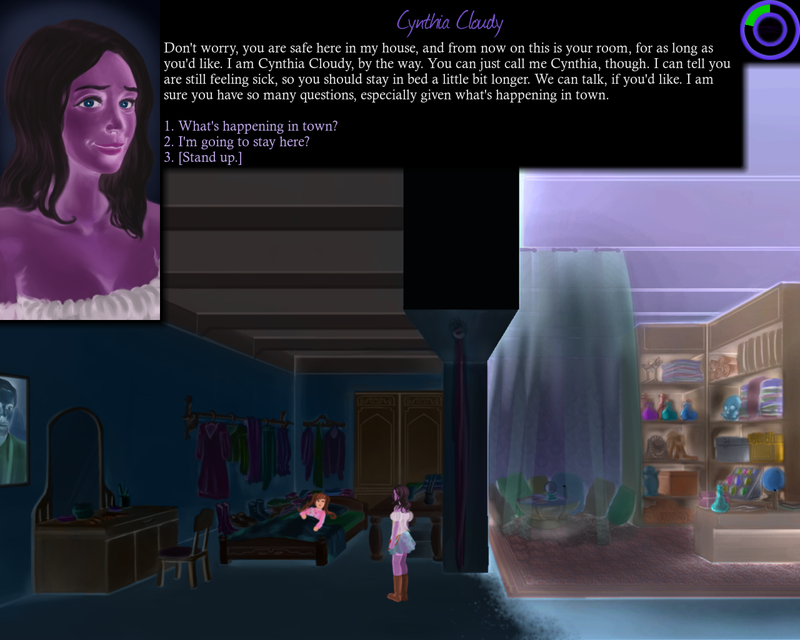 A Stitch in Time was a absolute pleasure to play and is a fully realised and full length sequel to the freeware adventure What Makes you Tick. What Makes you Tick, itself, is a fantastic adventure but now in the much longer and far more substantial adventure A Stitch in Time there is just that much more to love, particularly the expanded plot. A Stitch in Time takes place immediately after the end of the first game and continue from there, ending the immediate story arc but leaving the ending open enough to continue in the future. 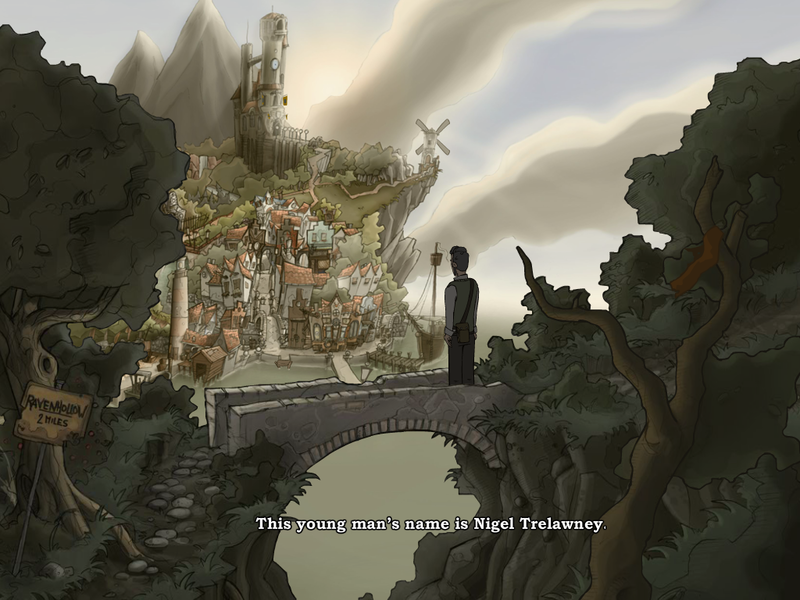 This time round, you play as Nigel Trelawney, the son of one of the Smith Institute scientists, Dr. Anthony Trelawney. Most of the game is comprised of you trying to settle your recently deceased fathers estate in Ravenhollow, the town that the Smith Institute is set within. And for the most part this involves your quest to find the insignia rings of the nine members of the Smith Institute. But all is not well in Ravenhollow, Thugs from the castle has taken over the town and are enforcing tyrannical rules and taxes on the people, people have disappeared, and other nefariousness things have occurred. But even more so then the overarching story is the local dialogue and happenings that drive the player forward and are simply superbly crafted. The most impressive aspect of the entire game is the presentation. The graphics are simply a superb, detailed, hand-drawn, masterpiece; There is simply so much detail put into each scene, with numerous objects that are never used other then simply to be there, all of them being fully realised with beautifully drawn and detailed graphics and descriptions. The soundtrack is similarly well done and a pleasure to listen to, but quite restrained and obviously not mean to take centre stage. The one thing missing is voices, of which there are none; But I, for one, did not mind. What is there to say about the puzzles? There is a lot of them. They are all of a high professional quality. The entire world, pretty much, is open form the very beginning and many extended puzzle arcs can be attempted at the same time or in any order. You can even rest in a few places flipping the time from day to night and back again which is needed to solve many puzzles. And in each time period you have a full, different, world to interact with. At night some people go to sleep, others come out, and some objects and animals appear or disappear depending on what time it is; And you are not artificially restrained to a small section at night, sure there are a few shops that are closed, but other places open up. One very impressive feature is that I cannot remember a simple puzzle that I liked less then any of the others. They are all good, and they all fit well within this amazing world created by Matthias Kempke. There is just so much to like about What Makes you Tick: A Stitch in Time. I don't think that it contains a single element that I liked less relative to the rest of the game and none of them were anywhere close to what I would consider average quality. The entire game is fantastic and in my opinion the best commercial adventure game to be released in the last few years. 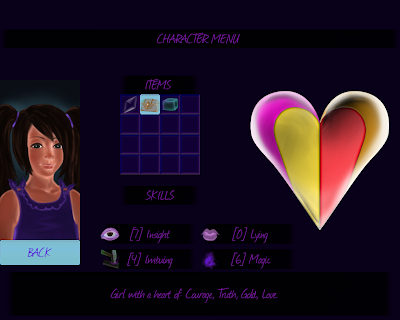 Girl with a Heart of is a new action adventure by the new indie developer Bent Spoon Games. Its most redeeming feature is the wide use of choice in its narrative. Unfortunately, the most obvious feature of the entire game is the unpolished nature of it. 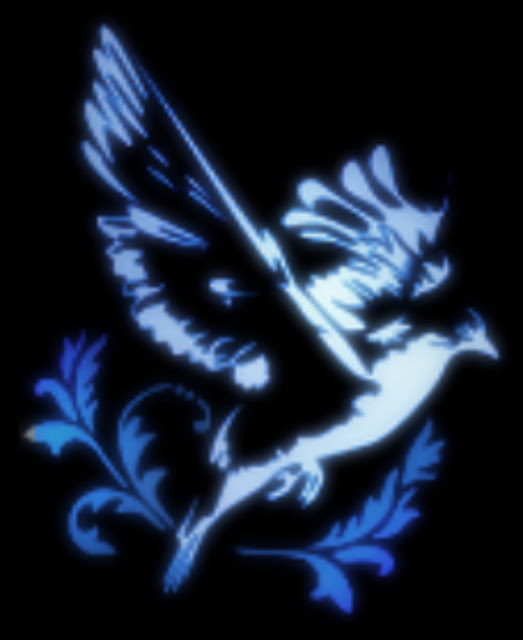 From the very start, with the games logo, it is obvious that both the game has very little polish, outside of the dialogue, and that this is probably a new developer with little experience. The graphics are interesting, and I rather like them. But like the rest of the game there are a few rough edges. It is a rather unique and even psychedelic style, not that that matches the gameplay. They are 2D and in particular I liked the player portraits but in general the abstract nature of a bunch of it was rather nice. But the list of problems is quite long. The text is horrible looking, the game is quite short, and while there is a RPG and combat system there is almost no combat whatsoever. But all of that does not have to ruin a game with redeeming features. And far more then any other game this game's narrative feels like real narrative, not at all unpolished. You seem to be constantly barraged with natural choices that effect the game world. These choices are given in both a obvious fashion (e.g. answering "Yes" or "No" to a question) and non obvious fashions (e.g. simply telling someone about a particular part of your day). It feels like you are having a real non scripted conversation with someone when you have to remember there history and make sure never to tell them something without weighing the consequences. This makes one common way of playing, that I use a lot, absolutely obsolete. You cannot just exhaust your dialogue tree as many options in it are choice making to use and absolutely do not give you any warning. It also makes it very replayable. So I would recommend this game but I would not recommend that someone actually buy it. There is a minimum amount of polish in all areas of the game that you should expect when playing a commercial title and that is simply lacking here. But maybe I am being to old-fashioned, if you intrigued by experimentations in narrative and want a game that focuises on that to the exclusion of all other aspects then this might be just the game for you. 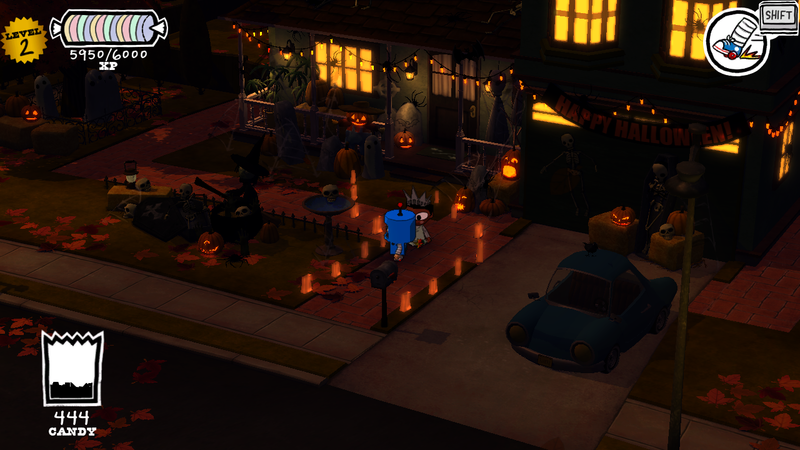 Costume Quest is the second, and most recent, Double Fine game to make it to the PC since Psychonauts. And like Psychonauts it has a lot of style. Costume Quest first came out on PSN and XLA and as such is quite a small game even with the addition of the DLC Grubbins on Ice. 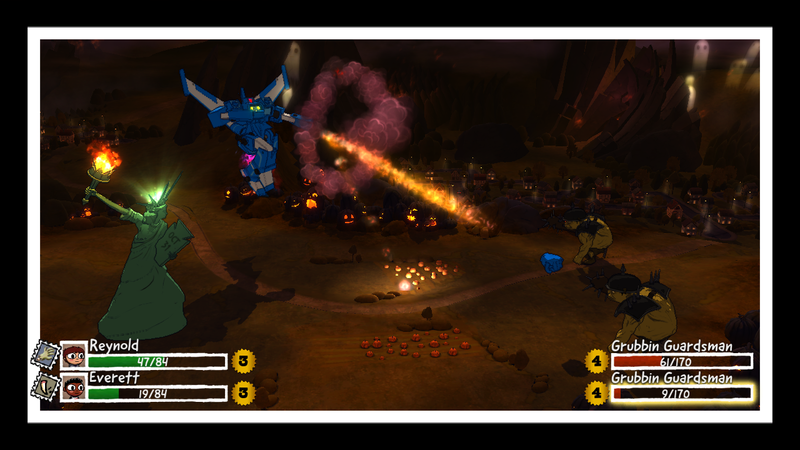 This is seen in all aspects of the game, from the plot to the gameplay. Everything is as minimalistic as it can be without sacrificing any of the necessary pieces. But altogether, including Grubbins on Ice, it does weight at about seven hours (if you wanted to get a 100% completion rate, not that it is all that hard or time consuming. 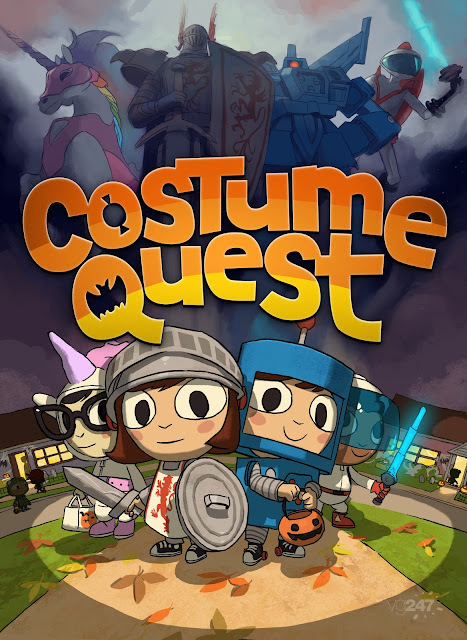 Basically, Costume Quest is a RPG where your party turns into super powered versions of your costumes while in battle and when out of it walk around as normal kids completing quests and searching for stuff. The battle gameplay depends on two main factors that you must worry about and your current level, but since the amount of XP you can acquire is set just visit all the houses and battle everyone you see and you will be at the expected level. The things that you actually have a hand in is your costume and battle stamps. You get new costumes be searching the map and finding pieces of costumes and as soon as you have a new one anyone in your party can use it. They all have different stats (health and damage, important early on but less so latter), special attacks (which you can use once every three turns), and some have environmental abilities. For the most part the ones that have environmental abilities are necessary at some point to continue, but the amount varies a lot and particularly the robot costume is useful simply because it allows you to walk far faster. The battle stamps start out quite mild but by the end are where most of the customization comes in; Do you want any one character to have double the attack power, get a huge amount of health every turn, or have a powerful stun attack; you can do that, the only problem is that you are limited to one per character. The game is simply fantastic and a must play for all lovers of Psychonauts. I am moderately conflicted on how I should spin this review. It is not a bad purchase to make, being moderately inexpensive and one of the only books about indie games; It even received universal praises from someone I would considered an absolute expert in all things literature and indie gaming; But there are still more then a few issues I had with this book that I want to touch on in this review, but first to the description. 250 Indie Games You Must Play is separated into three main sections with a very minimal introduction. This introduction most notably contains a few page attempt at a definition of what indie games are and a few other pages showcasing a bunch on mini interviews with prestigious indie developers. After this you are quickly thrown into the thick of things with by far the biggest section, Download Games; This section features indie games that are both free and can/have to be downloaded to be played. After this section you have Browser-Based Games and then finally Commercial Games, with all games in all sections being available for PC at the very least. Regarding the games themselves; They are not the ones I would of chose, if only because I have not even heard of a large percentage of them and have played even less; But of the ones I do know I have some different opinions of many of them and know of many games that I would of included (not that I would expect to agree with all of the choices). 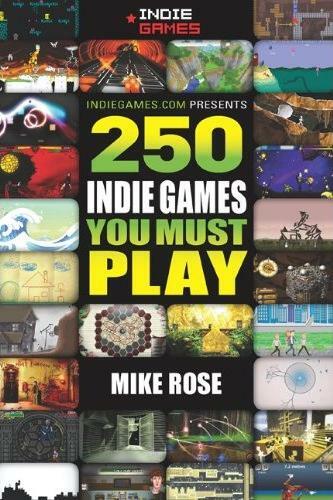 Also all games are not created equal and 250 games is a lot of games, I think a more exclusive sub list could of been included within this 250 to show off the very best of indie games and provide a starting point for interested newbies; Because as it stands now, even showing its age, I would recommend IndieGames.com's An In-Depth Indie Game Guide over and above this book for people interested in starting their foray into the world of independent games. Every game in each of these sections takes up one page and consists of a short description, a link, and finally a single full colour glossy picture. The descriptions are all pretty much boilerplate with three paragraphs; The first describing the story, the second the gameplay, and the third is mostly dedicated to describing the game itself, including awards, competitions, sequels, and sometimes additional thoughts on the game or just anything else that did not fit into the preceding paragraphs. The entire description is quite devoid of opinion or anything even close to a review on the game and sticks to the facts. The links are all relatively short and uniform and were constructed specifically for this book and redirect to their respective IndieGames.com articles. So now for the bad. The writing is not unique or amazing; There is not a new and unique opinion being expressed here or even beautiful poetic writing, it is simply cold hard facts professionally written and you can get longer and more detailed posts on any one of numerous sites for free. Over and above this, the book has more then a few issues I just consider unforgivable. To start off with a few games seemed to be in the wrong section; One "Download" game in particular I spent more then enough time searching for a downloadable version of the game to come to the conclusion that if one existed I would be very much surprised. And what I don't get is that all you have to do is flow the link provided to know that these games are in the wrong section, so how do you miss that? And don't even get me started on the in-book game links. These links seem to be designed far more to promote one of his sites, IndieGames.com, then to actually serve the readers of his book; not that this is a horrible thing to do, of all the existing sites IndieGames.com is the best one for this in my opinion, but the book itself is already providing a description so why link to another one? And what does he do when IndieGames.com never did a review of the game in question, he links the review of the sequel. And many of the IndieGames.com reviews themselves have broken links and you have absolutely no way of getting a copy of the game from them (making them basically useless). There are so many of these broken links that I would wager that most of them were present even before this book was written, which just seems particularly lazy. So is that what we have come to in this age of the internet, books are outdated before they are even released because they absolutely must contain links and no one will be bothered to even check before hand let alone maintain them after release? As far as I am concerned this make the book faulty and broken, I feel like I bought a Lego set and it came missing pieces (and my Lego recreation of Big Ben turned out looking more like the Leaning Tower of Pisa). But there is a solution to this link problem, even more then one. The most simple and elegant solution uses the nature of the links themselves to their full potential. They are designed to be redirect links, they can be internally, silently, and quickly changed to point anywhere you want. So point them the game's homepage (or most relevant page if no official page exists); And run a automated script that checks the current links to see if they still exist; Then, if these sites go offline you a person can spend 50 seconds looking for a replacement. Using this solution you would not even have to change the book, you could implement it as is. Alternatively, you could link to a specifically designed page that contains a few links and even a archived copy of the game in question (browser and commercial games exempted) so that you can guaranty easy access to the game at all times. In this way you have a set standard quality page you are linking to and do not need to link directly to some unofficial sketchy forum post or similar, and can even include a link to the IndieGames.com review. In summery, I don't know what to say. It is a one of a kind book but it is also far from perfect. And I am far from comfortable critiquing a fellow indie game reviewer that is so far ahead of me in terms of success and skill. But ultimately it has its faults and at least for me they are significant. I loved the too short introduction and would of loved to see it expanded with possibly the games serving as examples to a overarching narrative instead of simply a unsorted list of games. Recently finished a page dedicated to the graphical art of indie (independent) games over at my other blog The Indie Elitist. It is primarily a list of games that I found particularly beautiful. So if this sounds interesting to you check out the page here.